Because I knew my grandmother simply as “Mom-mom” for the first half of my life, I sometimes forget that she is more–a complex person who survived World War II and a woman for whom life has never been static. She worked as a nanny, a dentist’s apprentice, and even a model. She is also a descendant of German nobility on her mother’s side. Raised Roman Catholic, she had doubts about organized religion, especially after witnessing so much death in the aftermath of the Dresden bombings. Nevertheless, she converted to Judaism. Even though she detested organized religion as a child, my grandmother believes that Jews must preserve their identities. I asked her why it matters so much to her that I identify as a Jew. Even though I understood what my grandmother meant, I could not comprehend how she found the faith to believe after everything she had been through. Helga was six years old when the war broke out in 1939. While the children in Beuthen noticed little difference in their daily lives at first, a few years later, merely walking to school became a dangerous task. Helga’s parents opposed Adolf Hitler’s policies but never outwardly protested them. The Nazis considered anyone who challenged Hitler and his Reich a traitor, and traitors went to jail–or worse. All three of Franziska’s brothers were punished for opposing Hitler. Gregor was beaten publicly by a group of Nazis for speaking against them. Victor was sent to a concentration camp but fortunately was liberated after the war ended. Josef was also sent to a camp, although he met a more gruesome fate. The camp authorities informed Helga’s family that Josef had died. The family visited the building where Josef’s remains apparently were kept in hopes of bringing them hope for a proper burial. Not only were they not permitted to make arrangements to retrieve Josef’s body, they were also not allowed to open his casket to see him one last time. The family asked an elderly man who looked after the bodies why this was so. Although he said that he was not supposed to tell them, he eventually relented. To avoid fates like Josef’s, many kept their opinions private. My grandmother said it was dangerous to confide in others, even friends, since betrayals were common. So everyone kept their political views to themselves (or lied about them) and did what was necessary in order to stay out of trouble–at least most people did. But keeping quiet was not necessarily enough to keep someone out of harm’s way. When Helga was about nine, her father was drafted into the German Army. When she was ten, Helga was “drafted” into the Bund Deutscher Mädel, the female league of the Hitler Youth. All Aryan children were required to enroll. It only took a few sessions for Helga to grow bored and irritated. During Bund Deutscher Mädel activities, Helga was told what to do and what to believe, and she detested being forced to be and think a certain way. Helga decided to stop going. One of the group’s leaders came banging on the door of Helga’s house, insisting on speaking with her mother. But the official hostility toward her behavior only made Helga even more reluctant to return. Although she evaded going back, not everyone who rejected the Nazi Party was so lucky. When she was 10 or 11, Helga saw bodies dangling from the branches of a tree. Among the dead was a priest. Although the Nazis renounced religion, many pious individuals clung to their faiths. Soon though, it would not matter what anyone believed. When she was 11, Helga and her family were among the refugees who went on the run after learning that the Russians (a.k.a. the Soviet Union’s army), who were notorious for their savagery toward German civilians, were about to invade Beuthen. “I think they only had outhouses in Russia, so if you had an indoor bathroom [the Russians] thought you must be rich and had to be a Nazi…so they smeared their [feces] all over your walls,” my grandmother told me. Before the Russians invaded Beuthen, Helga’s mother gave each of her children a bag and told them they were leaving immediately. It was winter and bitter cold outside, so taking their heavy, wool coats was a must, especially since they were going to remain on drafty trains for long periods of time. Many Germans boarded refugee trains, seeking safe havens from a revenge-seeking, invading army. Most of the cities and towns en route from Beuthen claimed they had no space for the refugees, so the family kept on the move. “I felt like a yo-yo because the train kept going from one place to another since there was no place to stop,” my grandmother recalled. When the refugees would finally find a location to temporarily settle down, they would be placed wherever there was room, whether it was a farmer’s house in a small German town or in a large gymnasium-like building in the middle of Czechoslovakia, with nothing to sleep on but straw. Place after place, the refugees found themselves back on the trains. American planes were constantly overhead and they would fly down low and shoot at the trains, not knowing or seemingly caring who was aboard. And there was little food. One day, Helga and one of her three paternal tantes (German for “aunts”), left the train at a rest stop to find something to eat. Helga’s Tante Grete was worried about her baby, as she had trouble breast-feeding since she suffered from malnutrition herself. So Tante Liesle took Helga with her to find food for the adults and milk for the baby. This subjection to the stresses of constantly being in danger and the lack of proper nutrients was especially hard on the very old and very young. Helga’s three-year-old brother, Hansi, developed a high fever, which eventually turned into pneumonia. Helga and her family had no choice but to leave the train and get him to a hospital at the next stop–Dresden. They had been living in a small village outside of Dresden for about a week, staying with a farmer who provided them with free food and shelter in his home. Although they were used to bombs falling daily, this time it was different. It was nighttime when the sirens went off and the sound of planes overhead was louder than normal. Franziska told her children to stay inside, but they went out to see what all the commotion was about. Helga was standing in the yard when suddenly bombs started dropping over and over. Her mother began crying. Dresden, a metropolis of 750,000 once renowned for its history and culture, was transformed into a ghost town of rubble and ash in a matter of hours. Approximately 13 square miles were decimated. Somewhere between 18,000 and 25,000 people lost their lives that night. After the bombings stopped, Franziska and Helga searched for the hospital where they left Hansi. There were no street signs, no landmarks. Just smoke, the smell of burnt flesh, and debris. While looking for her little brother, Helga saw parts of dead animals as well as people with nothing left on them but their shoes. Their bodies were burnt black, reduced to a human coal. There was no way of really knowing where you were. The only markers were the haunting chunks of bodies. Franziska figured she was near where the zoo had been when she came across the remains of what appeared to resemble exotic animals. It was all so badly burnt it was hard to know for sure. When she realized what her young daughter was seeing, and not knowing if the bombings would begin again, Franziska sent Helga away from the bombed-out landscape and continued searching for Hansi on her own. “We were scared stiff, we thought there was no way he was still alive,” my grandmother said. The large hospital where Hansi was staying for his treatment, Gerhard Wagner, extended many blocks. Now, it was nothing more than rubble. The only reason Franziska recognized it as the hospital was because of the color of the yellow-beige bricks. She realized it must be the right place when she saw a group of trucks parked outside. Franziska had come just in time–the trucks were there to transport the children who survived in the hospital’s cellar. Transport to where was anyone’s guess. Other parents arrived, searching for their children, and in some cases, the Red Cross was able to help them. But for several families, the most they could do was pray that their children were still alive, hopefully somewhere safe. After hours of walking, Franziska finally found Hansi. Two days after the attack on Dresden, Helga’s family was back on a train. They eventually settled in Weiden, a little town in Bavaria. Because of the lack of space since bombs destroyed much of Germany, many refugee families were afforded makeshift living quarters created in former barracks. Helga’s family was lucky to receive housing in an actual building. It was part of a large apartment owned by a family who was forced to provide lodging by the German government. Since there were so many homeless refugees, the government ordered individuals with extra rooms to provide living quarters for those in need. Helga’s family lived in one small room together on the first floor, where they ate, slept, and bathed. Helga developed allergic rashes every time she washed in their metal bathtub. Since they had very little space, Franziska left the moveable tub in an outside storage room when no one was using it. On the second floor was a communal bathroom, which everyone in the building had to share. With two families on each of the three floors, the bathroom was frequently occupied. Only one family had a small, closet-like space in their apartment equipped with a hole that they used as a toilet. Luckily, Helga’s family did not have to live there permanently. After the U.S. Army occupied Weiden about six months later, Helga and her family moved into a nicer building where they acquired two rooms–right next to a bathroom. Although Helga finally had a roof over her head and no longer had to worry about bombs plummeting from the sky, she felt a strong sense of loss. Helga not only lost everything she ever owned (except for two changes of clothes and her winter coat), but she also believed her father was dead. For a while, listening to music was too hard for Helga emotionally. So many things that seemed indirectly related to her father–like music–reminded Helga of him. When Germany converted its currency from Reichsmarks to Deutsche marks in 1948, the currency deflated 10 to 1. To offset the loss, the German government provided each person with 40 additional Deutsche marks. With no other source of income, Fraziska decided she had to find work to support her children. She acquired a position working for a Jewish doctor cleaning his office. His name was Dr. Berg. He lost his first wife in a concentration camp but remarried soon after the war ended. There was a shortage of doctors, which was exasperated by the fact that a large number of liberated Jews from concentration camps needed medical care. Several of these Jews lived in a large hotel in Weiden called Cafe Weiss, which was transformed into a displaced persons camp. Since Jews were allowed to work again, Dr. Berg was able to open up a practice. And thanks to him, Franziska found work as well. With their mother gone long hours, Helga mothered her siblings as best as she could, wishing her father was there to take care of them all. In 1954, Helga’s family found out through the Red Cross that Herbert was alive, and he was reunited with them in Weiden. The Russians held him as a prisoner of war and somehow, the Red Cross was able to intervene. “He always said that we have to thank a Jewish doctor for him being alive,” my grandmother recalled. Herbert was so ill from working long hours, malnourishment, and heart trouble that a doctor was going to send a letter dictating that he should not work in the mines anymore, which is where the Russians were sending some of their prisoners. Throughout his captivity, Russian wardens frequently beat Herbert, leaving him with a permanent scar on the front of his head. His once dark brown hair was marked with a patch of white near his forehead–another lifelong reminder of his beatings. Terrified that the Russians would “get rid of him,” Herbert begged the doctor not to write the note and to let him work. She took pity on him, agreed, and brought him to her house to do minor jobs there. Herbert eventually regained his strength and made it back to Weiden, where the government gave him and his family a new apartment. When Herbert was strong enough, he worked for the new German government, and when he retired, he received a medal of honor. Herbert and Franziska remained in Weiden for decades. A heart attack ended Herbert’s life at 71 as he was dressing for church one Sunday morning. Franziska died on a Sunday afternoon at age 89 while talking on the phone to my great-aunt. They are buried in Weiden, together in a single grave, one body atop the other. While her parents were able to adapt and make Weiden their lifelong home, for Helga, who had grown up in a large, cultured city, it was dull and unrefined. “So why not go somewhere else?” I asked her. Helga was not the only one who disliked the city. The phrase “Wen Gott kann nicht leiden, den schickt er nach Weiden”–which roughly translates to, “If God does not like you he sends you to Weiden”–was popular among the refugees. One of the only places in Weiden that Helga did not loathe was school. “I loved school so much that when I had an operation on my toe and I wasn’t supposed to walk, I walked on my heel so I wouldn’t miss a day of class,” my grandmother told me. After Helga finished grade school, she went to Berufsschule, vocational school, where she trained to be a dental assistant. Although Helga dreamed of becoming a pediatrician, she did not have enough money to continue her education. Instead, she found a job right out of school and worked into her teenage years. She was now 18, and frequently went out with friends and dated boys. There were American soldiers stationed in town, and although they looked and sounded intriguing with their uniforms and accents, a girl would quickly get a bad reputation if she were caught dating one of them. Helga was at a friend’s birthday party in Weiden when she met Erwin. She thought he was irresistible with his suave attire, suntanned complexion, rosy cheeks, and black, curly hair. Like Helga, Erwin lost a great deal at a young age. His family was forced to leave their hometown of Czernowitz, Romania (now part of the Ukraine) and relocate to a city in the Soviet Union called Moghilev-Podolsk (also Ukraine today). While living in a ghetto, Erwin’s father, Max, died of typhoid fever and his body was thrown into a mass grave. Then Erwin’s sister, Clara, died of pneumonia soon after the war ended. Since there was no penicillin, Clara’s family could do nothing except comfort her while she was dying. She died on her 24th birthday. When the Russians liberated Moghilev-Podolsk in 1944, Erwin and his mother, Mali, returned to Czernowitz. About four months later, the Russian Army drafted Erwin, who was now 18. He was discharged almost a year later after an agreement was reached that allowed Romanians like Erwin to either return to their hometown, regardless of what country it was a part of now, or settle in another part of Romania. While her son was in the Army, Mali obtained a visa and headed for Chicago, where three of her brothers had moved to after the First World War. When Erwin was discharged, he was unable to join his mother, as the United States had reached its quota. After acquiring his visa in Bucharest, Erwin left for Paris and lived there for a year. His uncle Harry, who knew the consul of the Dominican Republic residing in Chicago, helped Erwin get another visa. Since the Caribbean was closer to the United States than France, Erwin moved once again. While in Santo Domingo, he found office work in a mattress factory. A year later, Erwin’s uncle Max sponsored him and he was permitted to enter the United States. “His uncle Max knew Sidney Yates, who helped him come here,” my grandmother said. Yates was a well-known Jewish congressman from Chicago who held his seat for almost 50 years. He also sponsored the legislation that lead to the establishment of the United States Holocaust Memorial Museum in Washington, D.C. Thanks to Yates, Erwin’s entry into the United States was expedited. In order to become a U.S. citizen immediately and not wait several years, Erwin had to register with the Army. He was drafted a year after arriving to the country. His name back then was Igor–when he was 26, he changed it to Erwin per the Army’s suggestion as a precautionary measure since he was previously associated with the Russian Army under his birth name. Since he could speak seven languages (he is fluent in English, German, Romanian, Russian, Yiddish, and knows some Spanish and French), Erwin was assigned a position with the Military Intelligence Service. He was first sent to Stuttgart. His unit then moved to Weiden to interrogate illegal aliens at the border of Czechoslovakia. Helga agreed to go out with Erwin, so long as he never wore his army uniform in public–a girl had to protect her reputation, after all. Erwin agreed and on their first date, he took her to the circus. Although Erwin liked Helga, he dated other girls. Fed up with Weiden, Germany, and Erwin’s dating record, Helga left for Canada at 19 after her friend Fritz decided to move there as well. Helga and Erwin wrote to each other. Helga’s mother also wrote to her and told her anytime she saw Erwin with girls. In one letter, Helga mentioned to Erwin that she met a man who hoped to marry her someday. He was right. On Thanksgiving Day, November 25, 1954, Helga married Erwin in Toronto. 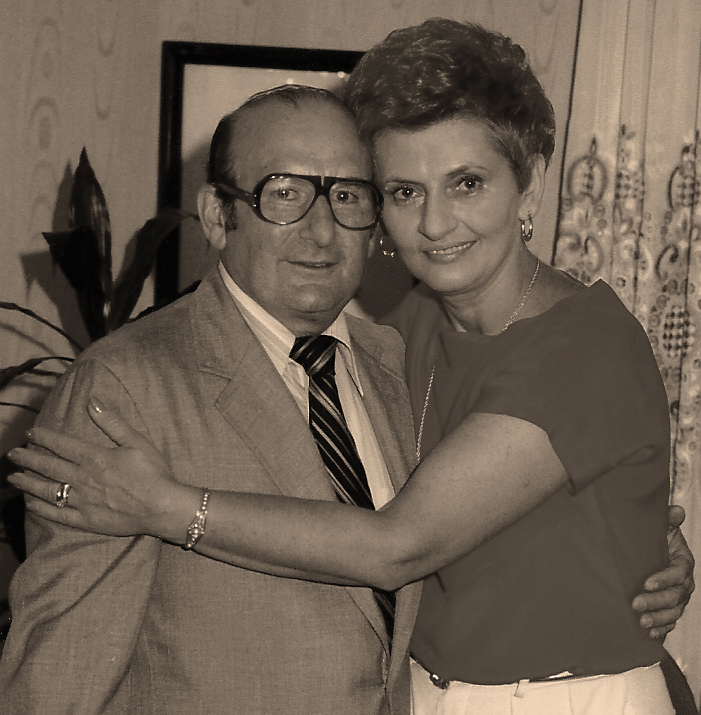 When Helga moved to Chicago four months later, Erwin told her he was Jewish and asked if she would convert. Helga was excited to become a Jew. During the two years she lived in Canada, she worked as a live-in nanny with a religious Jewish family. “I lived like a Jew and I wasn’t even a Jew yet,” my grandmother recalled. Helga’s Roman Catholic father, Herbert, who remained in Germany, supported her conversion, saying the war took too many Jewish lives and that the faith needed more members. “My father had several Jewish friends, so Judaism wasn’t so foreign to him either,” my grandmother said. Similarly, Erwin’s mother welcomed Helga to her faith and family. Just as her mother-in-law had, Helga also has two sets of cutlery and dishes–one for dairy and one for meat, as well as a separate set for Passover, in accordance with halachic law. And just as Mali did, Helga lights Shabbat candles every Friday night. And after all the death she had witnessed, Helga was drawn to the focal point of Judaism–celebrating life. As a result, she did not take Judaism just in name–she took it on as her full identity. Melissa Suran is a freelance journalist from Chicago currently pursuing a doctorate at The University of Texas at Austin. She has a masters degree in journalism from Northwestern University and her work has been featured in several publications including Chicago Journal, the Chicago Sun-Times, Crain’s Chicago Business, EMBO reports, and Kaiser Health News. What an amazing story! Let us hope that the memories of those who survived and prospered will continue to guide generations to come.